It never ceases to amaze me how computer hardware has advanced in functionality and declined in price. About 7 years ago, I bought my first Flatbed Color Scanner. At the time, Color Flatbed Scanners were the new "Up and Coming Technology" for home users, and I paid a premium price for it (around $1300.00US). I bought it from a company called Envisions which, by the way, is still in business (no small feat considering the competition in this industry). The Scanner is actually a Tamarack, repackaged with the Envisions name and Model Number (6000C). It has a SCSI Interface, but unfortunately it is a proprietary SCSI card and there are no OS/2 drivers available for it. The scanner will NOT work with any other card (Termination for both ends of the chain are on the card). Even though the scanner still works great, I decided that I wanted to be able to actually scan something, again. Since I no longer own a machine with Windows on it, I needed an OS/2 solution. Then, I came across a USENET post for a "Special Deal" from Solutions Technology - http://www.stiscan.com/prodcat.html#Imaging Product Catalog. This bundled deal included a copy of Applause Image Viewer for OS/2 and an Epson ES1000C Color Flatbed Scanner, all for $139.00 (US). I thought it sounded like a good deal, so I ordered it. Unfortunately, STI does not yet have the capability to do Credit Card processing, so I had to actually snail-mail them a copy of the Invoice they FAXed me with a check to cover the cost (+shipping). The bundle arrived about 1 1/2 weeks later, and I realized that I had no more available IDs on my SCSI bus. So, I disconnected a SCSI ZIP drive (External) and plugged the scanner in. I decided to hold off on loading the Applause software, since I was really interested in running the CFM Twain drivers along with PMView. Installation went without a hitch, but actually using the scanner was another story. You see, I still had an External Iomega JAZ drive on the SCSI Bus, and the scanner and the JAZ drive didn't really play well together. Removing the JAZ drive from the chain resulted in perfect operation the first time (I won't get into the hassles involved with losing 2 drive letters .... suffice it to say that I'll plan a LOT better when doing my next installation). Installing the CFM Twain Drivers was a snap. Everything went as planned, and a simple reboot resulted in the drivers being loaded and the scanner was recognized by the AIC7870.ADD driver (driving an Adaptec 3940 SCSI Adapter card). I've been running the latest beta of PMView 2.0 for some time, so I already had that installed. For anyone not familiar with PMView, I highly recommend that you download a demo version of it from BMT Micro - http://www.bmtmicro.com/catalog/pmviewcfm.html. Check out the bundle deal of PMView and CFM Twain. The current license for PMView is Lifetime. All future upgrades are free. Once PMView 2.0 is released, the lifetime license will no longer be offered. A side note: I must say that the PMView BETA has been the most interesting and unique beta program that I've ever been involved in. All discussion takes place in a mailing list, all suggestions for bug fixes and/or new features and/or revised methods of implementing features are considered by the developer, and user input is very much shaping the final version of this software package. New beta drops occur about 1-2 weeks apart, with "test .exe's" dropped as needed (sometimes within 12 hours of a bug report, or a request for a new or updated feature). I just can't say enough good things about this experience. I registered PMView 1.x to take advantage of the Lifetime Registration, and joined the beta program (open to registered users only). I had no idea what I was getting into, and I'm MOST pleased. For more on the PMView 2.0 Beta check out Don Eitner's recent VOICE Newsletter articles - http://www.os2voice.org/VNL/past_issues/VNL0399H/vnewsfe.htm and http://www.os2voice.org/VNL/past_issues/VNL0499H/vnewsfe.htm . Next step was to fire up PMView and choose Select Source from the "File" menu. CFM Twain was in the list box, and already selected, so that was easy enough. Next, I chose "Acquire" from the "File" menu. The CFM Twain operations box appeared, and I ran through the tabs to make sure all the settings were correct. I chose the default settings, and proceeded to do a "Pre-Scan". 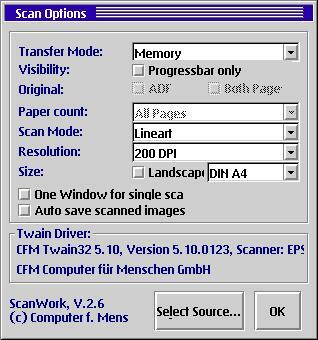 Prescan is a preview scan. 1 quick pass of the entire flatbed, or user definable area (though it'd be a difficult to define the area unless you knew exactly where you placed the image). Once the Pre-Scan had completed (I chose Maximum Size) and the image appeared, I simply click-dragged the borders until I had framed the area of the pre-scan image that I wanted. 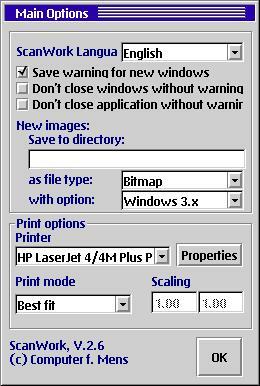 Then, I clicked on Fine Scan button, and the area that I had selected was scanned. 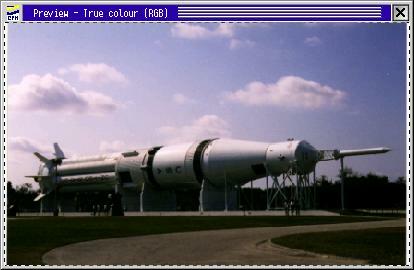 The image appeared in PMView, I clicked on FINISH from the CFM Twain window, and viewed a full size image. Pressing the "-" key a few times brought the image into a size that allowed me to view the entire image without scrolling. I selected the "Color" option from the drop down menu, and chose : Brightness/Contrast". This allowed me to "clean up" the image and make it easier to view at a smaller size. Choosing "Crop" from the EDIT menu selection allowed me to decrease the image further by cropping out unneeded background. 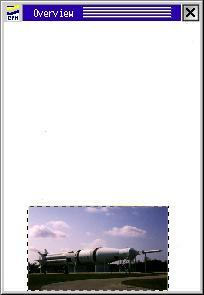 Choosing "Transform" and then "Size" allowed me to reduce the size of the image so I could place it in a Web document. I did this in two stages. First, I reduced it in size to 25% of it's original size. Then, I reduced that by 50%. I did it this way by trial-and-error ..... viewing the web page in Netscape to see how I wanted it to look, without using HTML code to resize the image. 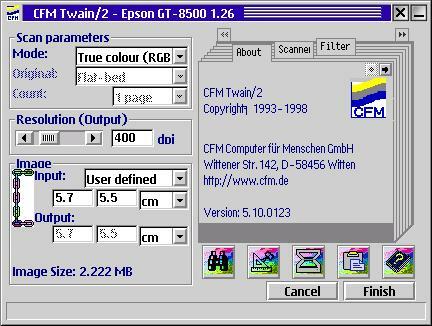 CFMTwain allows you to specify options for both Scanning and Printing. I never did get around to installing the Applause software. The CFM Twain and PMView combo works very well, and I'm quite pleased with the results. I think you might be, too. NOTE: As of Publication Date, I'm not sure if STI has any of these bundled deals still available. But the Epson Scanner I reviewed was an older model, and if you look around, you should be able to find one of these scanners at close-out prices as it is at least a year old.